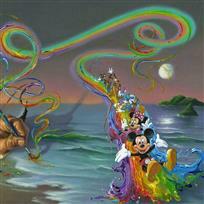 Long Beach, California native Jim Warren creates magical, color-filled masterpieces that have made him one of today's most sought-after and prolific artists. 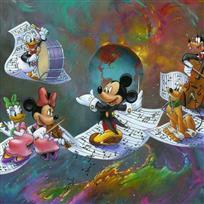 You've seen his art even if you don't know it, for Warren has been commissioned to create billboards, award-winning album covers, set props for TV, and book covers -in addition to his own personal creations - across the country over the last several decades. 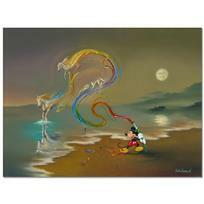 Inspired by Salvador Dali, Warren combines razor-sharp Realism with gorgeously whimsical Impressionism, Pop Art, Surrealism - you name it, Warren has absorbed many impressions and influences to create a style all his own. 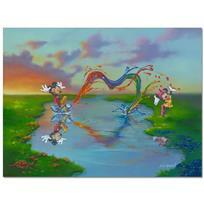 What makes Warren truly happy is this: "The letters and emails I get from people around the world who say they have been touched in some way by my paintings. 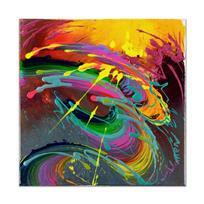 The fact that my art can create an effect like that for some people, and act as a positive influence in their lives, means a great deal to me." 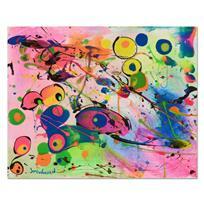 Jim Warren, "Painted Umbrella with Painted Rain" Original Painting on Canvas, Titled Inverso Hand Signed with Certificate of Authenticity. 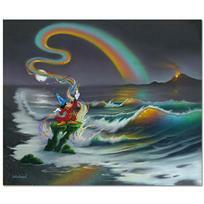 Jim Warren, "A Look At the Ocean in Abstract" Original Painting on Canvas, Titled Inverso Hand Signed with Certificate of Authenticity. 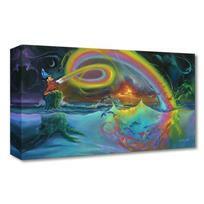 Jim Warren, "Those Eyes" Original Painting on Canvas Board, Titled Inverso Hand Signed with Certificate of Authenticity. 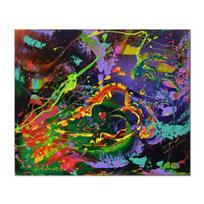 Jim Warren, "Octopuses Garden" Original Painting on Canvas, Titled Inverso Hand Signed with Certificate of Authenticity. 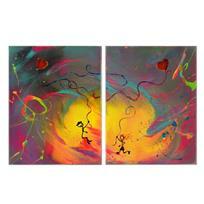 Jim Warren, "Long Distance Message (Diptych)" Original Painting on Canvas, Titled Inverso Hand Signed with Certificate of Authenticity. 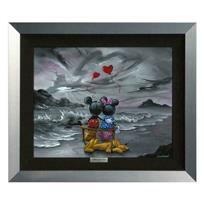 "Mickey and Minnie Forever Love" Framed Limited Edition Canvas by Jim Warren from the Disney Fine Art Silver Series; with COA. 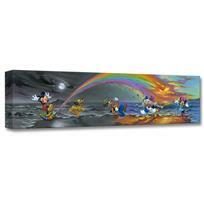 "Mickey and the Boys at Rainbow Falls" Framed Limited Edition Canvas by Jim Warren from the Disney Fine Art Silver Series; with COA. 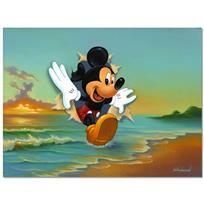 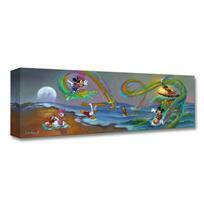 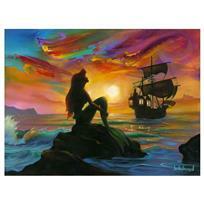 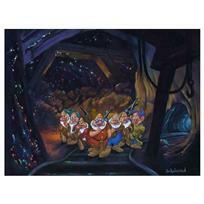 "Surfing with Friends" Framed Limited Edition Canvas by Jim Warren from the Disney Fine Art Silver Series; with COA. 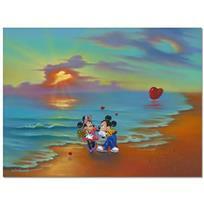 "Mickey Makes Our Day" Limited edition gallery wrapped canvas by Jim Warren from the Disney Fine Art Treasures collection; with COA. 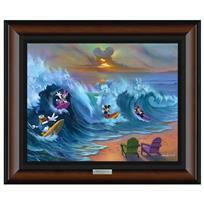 "Mickey's Crazy Wave" Limited edition gallery wrapped canvas by Jim Warren from the Disney Fine Art Treasures collection; with COA. 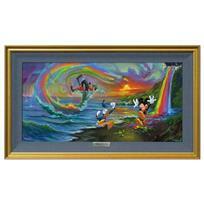 "Mickey's Magical Colors" Limited Edition Gallery Wrapped Canvas by Jim Warren from the Disney Fine Art Treasures Collection; with COA.